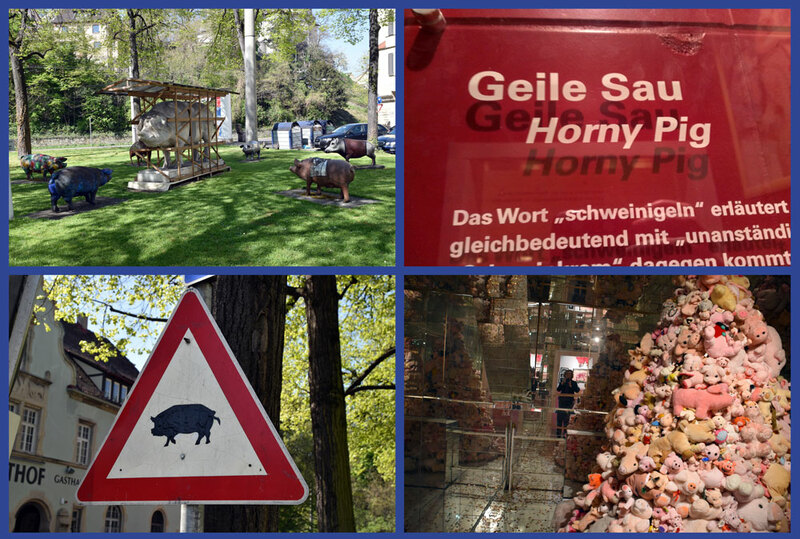 SchweineMuseum « Phloggings will continue until morale improves…. Breakfast! 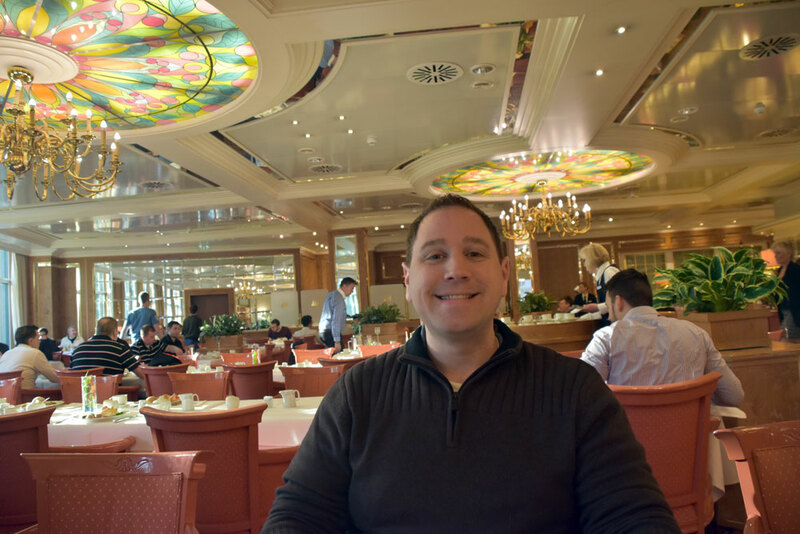 Every morning we had “free” breakfast at our hotel the Maritim. Well it was free to us. Normally it’s 21 Euro. (!) The Euro exchange when we went was about $1.08 dollars to 1 Euro. 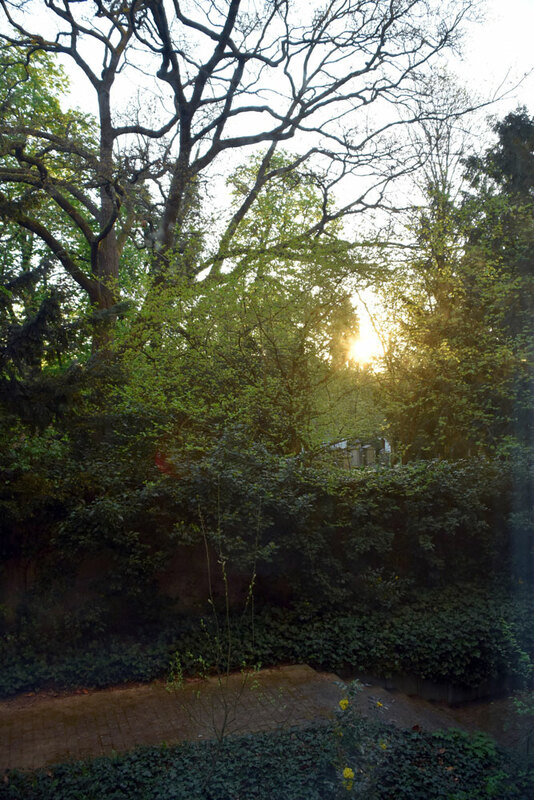 The dining room was exactly as beautifully bright & sunny as pictured, it overlooks the same cemetery as our room, making me again forget we were in the middle of a big German city. I filled up on pancakes, bacon & fruity strudel. The pancakes they offered were halfway to being crepes rather than the thick, fluffy buttermilk pancakes we normally make at home, but I still covered them in syrup. In the picture below I’m actually on my second plate (it was a buffet style breakfast), I picked various breads (more bacon) & plumb jam. The next morning I realized you put your jam into these tiny ice-cream cone like cups they provide, then it doesn’t get into everything. Aaron is more the pancake & sausage kind of guy. I loved sitting there listening to all the conversations in German. 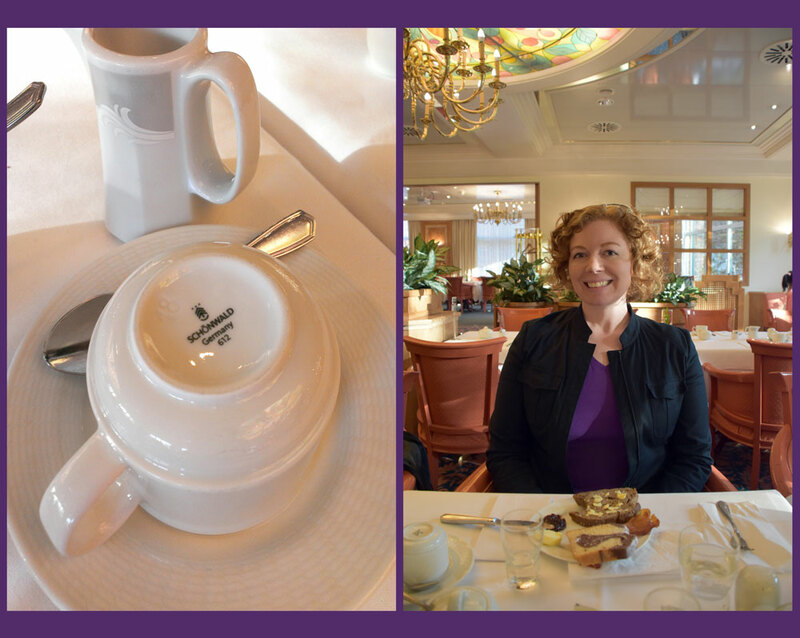 I did pick up on a few words I remembered from my college German class & the audio refresher course I listened to in the weeks before our trip. Aaron headed off to the nerd conference & I was free. Free at last! Actually I was suddenly very intimidated to have limitless possibilities for the day. I attempted to use my normal go-to device, my phone, to look up city tour information & map everything out, but both cell service & internet service were much too slow. I literally wasted an hour on that before asking the front desk for a city map (paper) & a StuttCard. The receptionist marked our hotel with a big “x” on the paper map & I started walking. The StuttCard was totally worth the money even just for all the public transportation I used. The first couple of days though I walked everywhere, which was a great way to get a close-up look & feel of the city, but a whole day of it did get to be tiring. I walked toward the big red “i” for tourist information on my map & since it was so early none of the shops had opened. I had the city to myself. I loved that walk. Referring to my map only once or twice I ended up right at the Tourist Information. 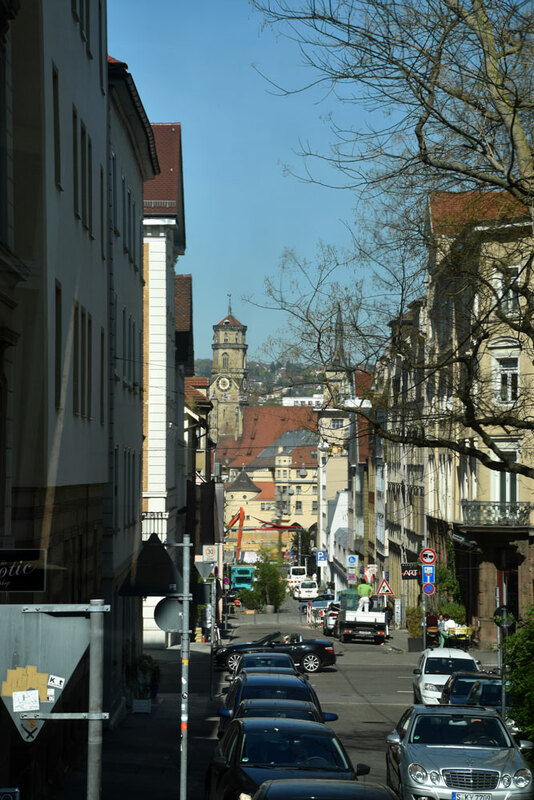 I asked about the Stuttgart City Bus Tour & they pointed me to the stop outside letting me know I had about 20 minutes until the very first bus of the day. 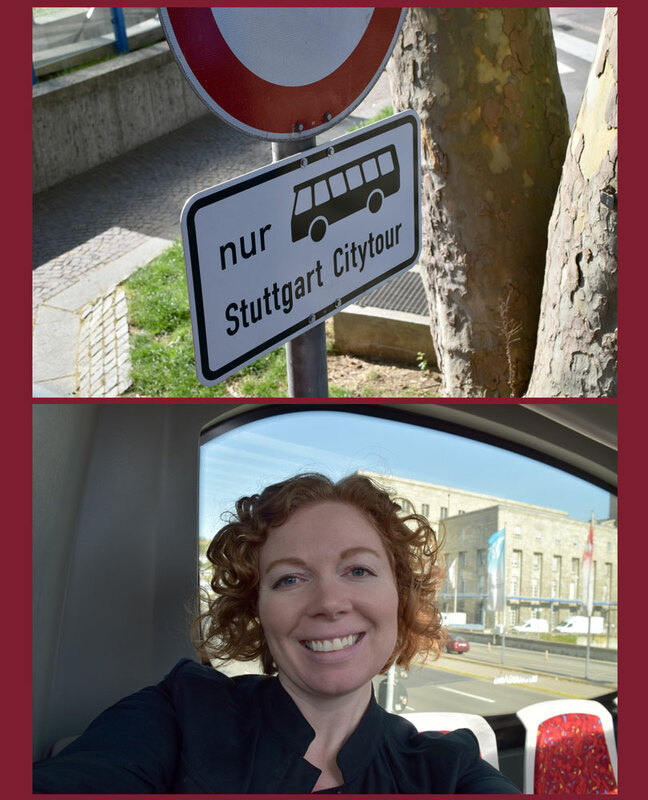 I showed these pictures to my friend Loradona & she said “nur” (on the sign above) means “only,” so that meant the bus stop was only for the Stuttgart Citytour. If “nur” she had been with me on this trip! I picked the very back seat with the big window & had it all to myself. There ended up being only 6 or 7 people on the top level of the big red double decker bus that morning anyway. 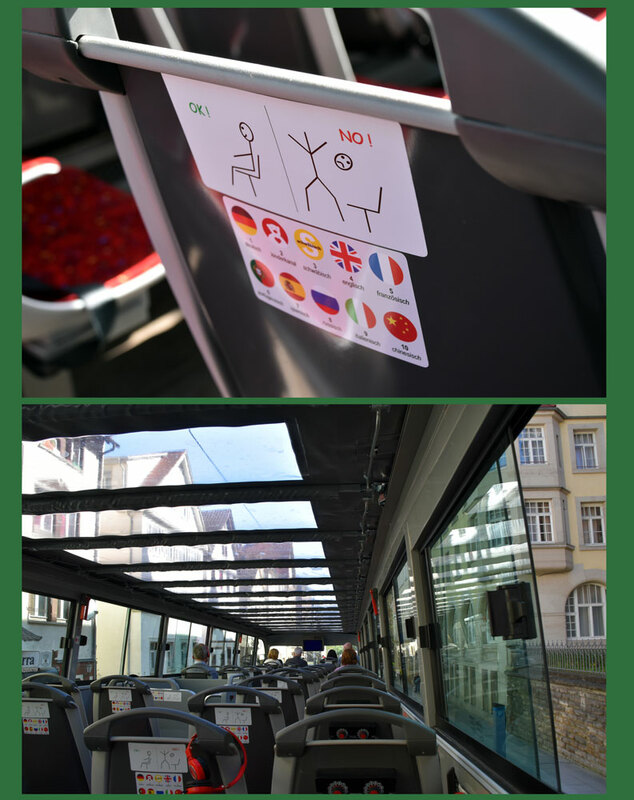 The first rule of the Stuttgart City Bus Tour, “Ok! No!” Next you pick your language, I picked the “Kinderkanal,” because they have the love bear icon, & I love Bear. Turns out that’s the German kids channel. Next I picked the British flag marked “englisch,” & even though I’m not British I understood it all perfectly. That’s what the red headphones are all about. They had the top of the bus covered because it was kind of cold that morning, but later it warmed up & the top came off (like tops usually do in such situations). Enjoy my wild curly hair (pictured below). One of the first interesting things we passed was the “Schellenturm.” (Ring Tower?) First built in 1564 as part of Stuttgart’s defensive wall & rebuilt a couple of times in various skirmishes & now it’s a restaurant. Other interesting things I saw on the way, a Brazilian flag hanging proudly on a balcony, the Schlossplatz (castle square) & I saw Spider-man twice. The first time I thought it was an actual guy dressed up as Spider-man on a balcony & an hour later I saw a toy Spider-man caught in metal bird spikes over a window. Enough of the Spidermen (of Schenectady), on to the pigs! Yes you really did need to see that close up. 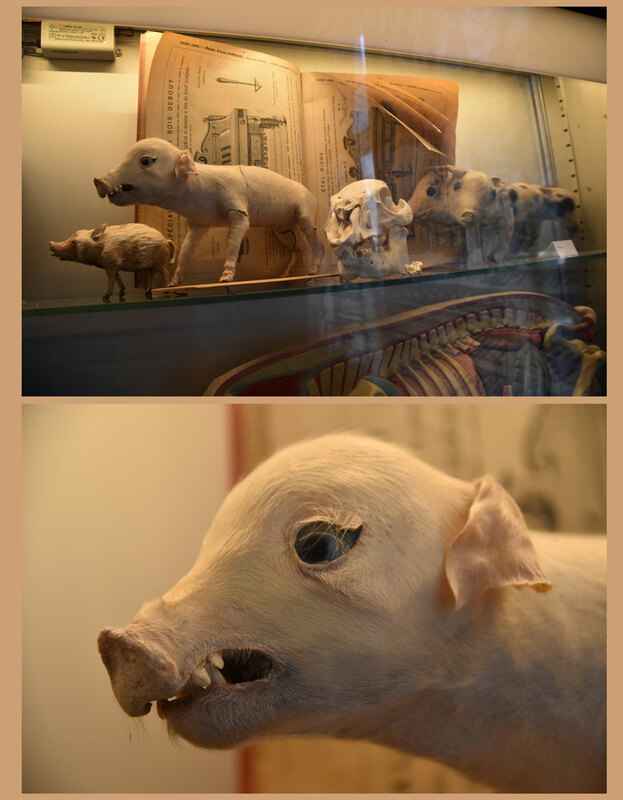 Taxidermy pigs, siamese twin pigs, & a full pig skeleton (not pictured) in the room called “the laboratory.” They had different themes for each room. 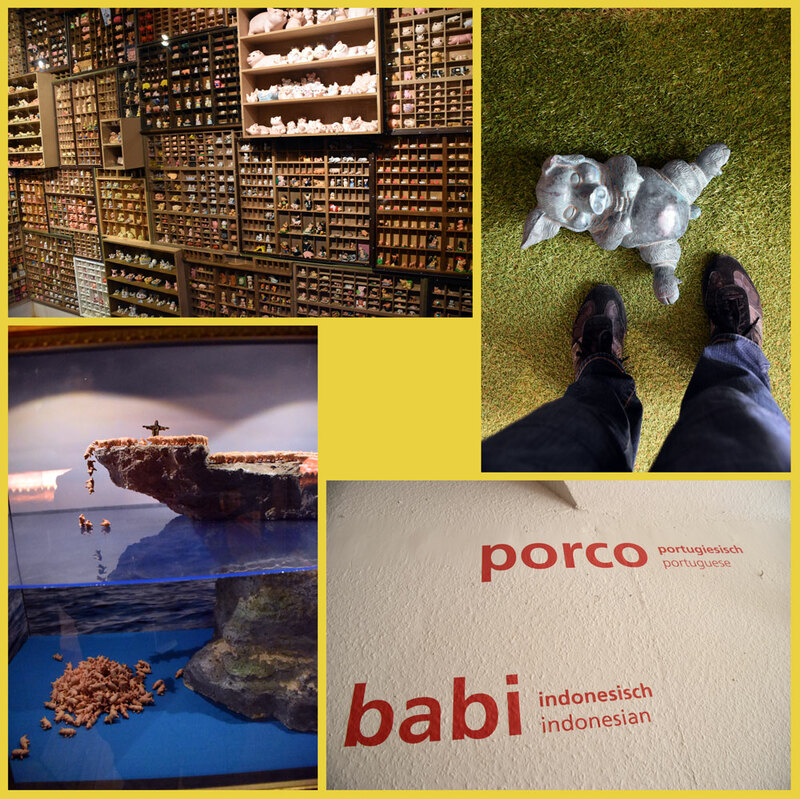 A few of the themes were; the butchering room, the wild boar forest, pet pig room (including fake grass on the floor, pictured below), in the pig library (as well as tons of pig books) is a 4 foot long terrarium full of plastic dinosaurs all with plastic pig noses, curly tails & cloven hooves added to each one. 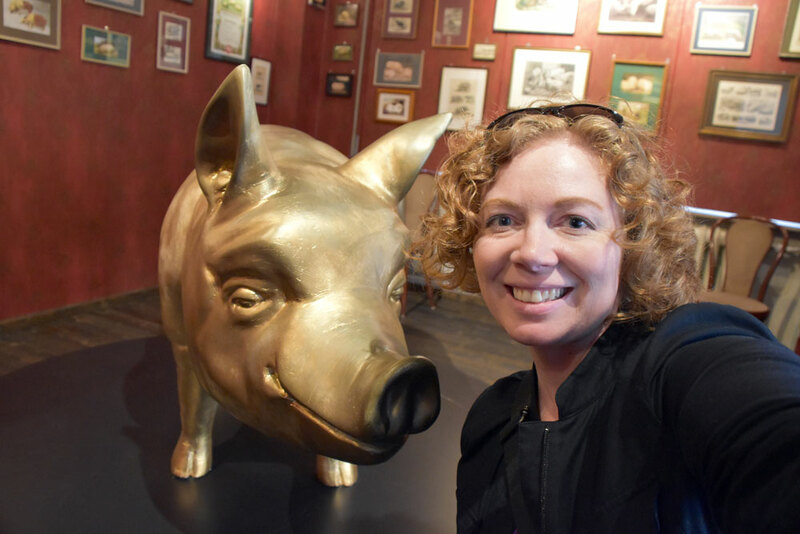 A portrait gallery (the first picture in this post, my selfie with the large gold pig), famous pigs room with Miss Piggy from the Muppet Show playing on several TVs, a room full of porcelain piggy banks, pigs in the mythology room (Jesus casting demon pigs into the sea below), the horny pig room (exactly as inappropriate as that sounds) I blushed as red as the walls & the pig museum hosts weddings! My hour was up & I made my way back to the bus stop. 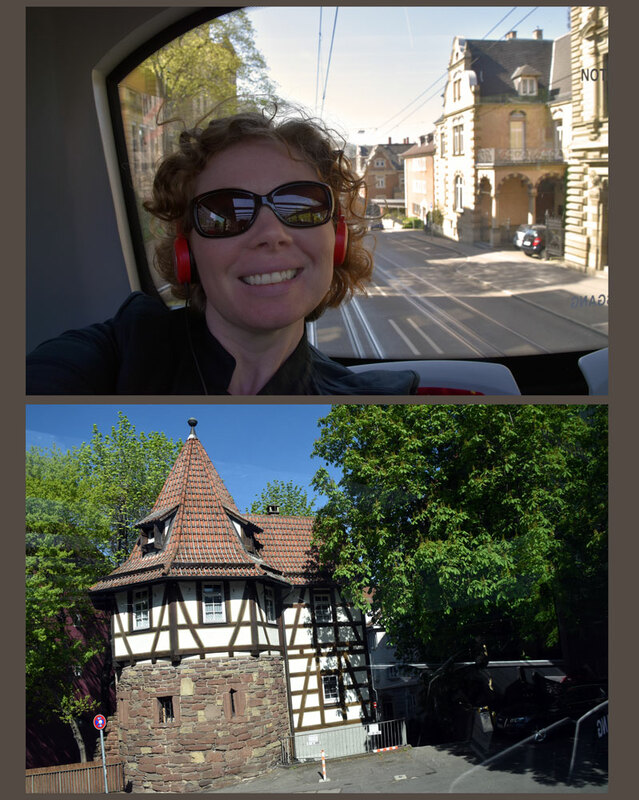 The week before we came to Germany I went through the list of stops they offered on the Stuttgart City Bus Tour & after researching each one I decided which I was the most interested in visiting, since it would be impossible to see everything. I sat at the stop & looked through the list I’d made on my phone planning my next move & glancing up I see this big double decker red tour bus speed right past me. I’m stunned thinking of the hour I’d waste sitting here waiting for the next bus. Before I can really get concerned I see the same big red tour bus come around the corner & pull in at the stop. I guess 3 lanes was too many for the bus to cross after making a left, or something, I was just glad not to be left behind. Don’t I look so happy? 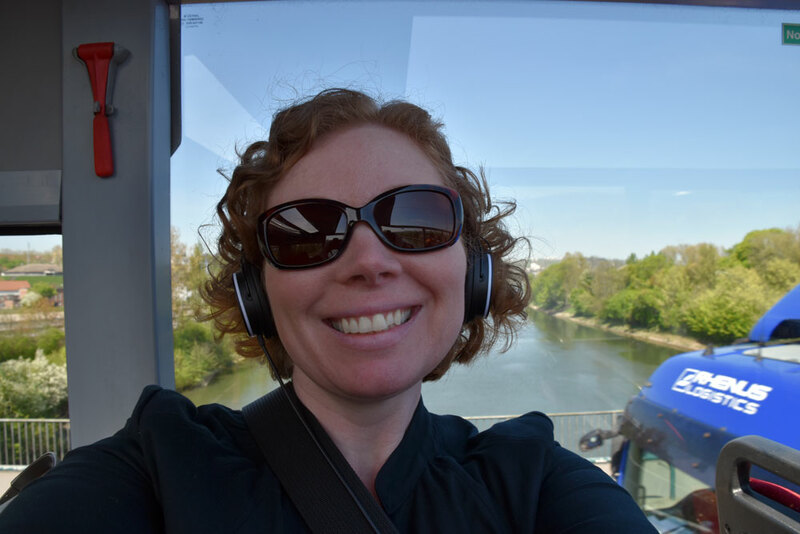 This is crossing the Neckar River. Same tour, different bus, different colored headphones. After leaving Stuttgart the Neckar River flows South to North up through Heidelburg & merges with the Rhine River in Mannheim. The bus tour passes the Porsche arena (soccer) & stops at the Mercedes-Benz museum. Both car companies have their headquarters in Stuttgart. 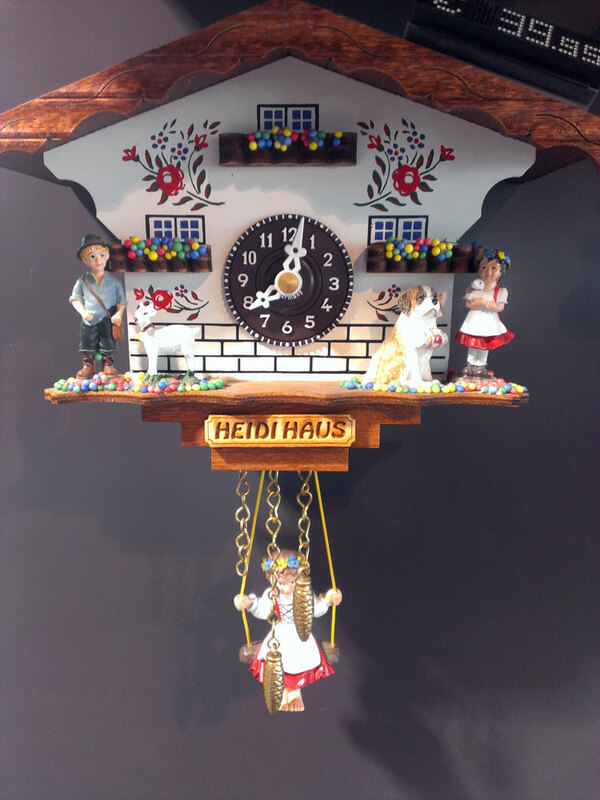 They also passed near the Stuttgart Spring Festival (read beer-fest), & the city zoo Wilhelma. I wasn’t interested in visiting any of those just now, I had my sights set on Höhenpark Killesberg, it has a petting zoo, children’s train & an intriguing tower. Stay tuned for the next Germanic episode. See that big smile you have on your face in the last picture? That’s like the big grin I had on my face the whole time I was reading this! What fun! Loved every detail!